the submit button or everythink else what we add to form in 2nd row had left padding. is there any finesse to solve this problem? click the submit button and a button a new tab will appear in the form builder's toolbar. 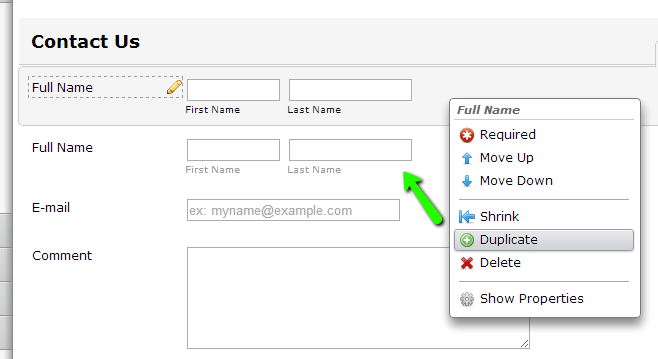 Click the one labelled Button Align, select Left and save the form. If you would like further assistance, we'd be happy to help. You could then change the elements in the duplicate to suit. Also, CSS can be injected to bring the check boxes closer together. I'll work on an example and get back to you. Of course, as additional check box fields are added, the new CSS will need adjusting. But we're always here to offer assistance when necessary. I forgot to mention that you will need to insert a break tag after TT-352 and another after TT-31 to make the Brilliant Blue and Red Mahogany labels appear correctly.